Fast Facts: Alfa Romeo celebrated the "Alfa Century" on June 24 2010. 100 years of fast macchina! In 2014 Alfa Romeo returned to the United States where Alfa's had been absent from dealer showrooms since 1995. Alfa Romeo Owners GroupThe Alfa Romeo Owners Club-USA (AROC-USA) is all about experiencing your Alfa, sharing the experience and having fun. You don't have to be a mechanical genius, or drive like Fangio. All you need is an appreciation of driving a passionately designed Alfa Romeo. The company that became Alfa Romeo was founded as Società Anonima Italiana Darracq (SAID) in 1906 by the French automobile firm of Alexandre Darracq, with some Italian investors. One of them, Cavaliere Ugo Stella, an aristocrat from Milan, became chairman of the SAID in 1909. The firm's initial location was in Naples, but even before the construction of the planned factory had started, Darracq decided late in 1906 that Milan would be a more suitable location and accordingly a tract of land was acquired in the Milan suburb of Portello, where a new factory of 6,700 square metres (8,000 sq yd) was erected. Late 1909, the Italian Darracq cars were selling slowly and Stella, with the other Italian co-investors, founded a new company named A.L.F.A. (Anonima Lombarda Fabbrica Automobili), initially still in partnership with Darracq. The first non-Darracq car produced by company was the 1910 24 HP, designed by Giuseppe Merosi, hired in 1909 for designing new cars more suitable to the Italian market. Merosi would go on to design a series of new A.L.F.A. cars, with more powerful engines (40-60 HP). A.L.F.A. also ventured into motor racing, drivers Franchini and Ronzoni competing in the 1911 Targa Florio with two 24 HP models. In 1914, an advanced Grand Prix car was designed and built, the GP1914 which featured a four cylinder, double overhead camshafts, four valves per cylinder and twin ignition. However, the onset of World War I halted automobile production at A.L.F.A. for three years. Alfa Romeo Automobiles S.p.A. was officially founded on June 24, 1910 in Milan. Alfa Romeo has been a part of the Fiat Group since 1986, and since February 2007 a part of Fiat Group Automobiles S.p.A. The company was owned by Italian state holding company Istituto per la Ricostruzione Industriale between the end of 1932 to 1986. The company was originally known as A.L.F.A., which is an acronym for Anonima Lombarda Fabbrica Automobili (English: Lombard Automobile Factory). The company that became Alfa Romeo was founded as Società Anonima Italiana Darracq (SAID) in 1906 by the French automobile firm of Alexandre Darracq, with some Italian investors. One of them, Cavaliere Ugo Stella, an aristocrat from Milan, became chairman of the SAID in 1909. The firm's initial location was in Naples, but even before the construction of the planned factory had started, Darracq decided late in 1906 that Milan would be a more suitable location and accordingly a tract of land was acquired in the Milan suburb of Portello, where a new factory of 6,700 square metres (8,000 sq yd) was erected. Late 1909, the Italian Darracq cars were selling slowly and Stella, with the other Italian co-investors, founded a new company named A.L.F.A. (Anonima Lombarda Fabbrica Automobili), initially still in partnership with Darracq. The first non-Darracq car produced by company was the 1910 24 HP, designed by Giuseppe Merosi, hired in 1909 for designing new cars more suitable to the Italian market. Merosi would go on to design a series of new A.L.F.A. cars, with more powerful engines (40-60 HP). A.L.F.A. also ventured into motor racing, drivers Franchini and Ronzoni competing in the 1911 Targa Florio with two 24 HP models. In 1914, an advanced Grand Prix car was designed and built, the GP1914 which featured a four cylinder, double overhead camshafts, four valves per cylinder and twin ignition. However, the onset of World War I halted automobile production at A.L.F.A. for three years. Enzo Ferrari proved to be a better team manager than driver, and when the factory team was privatised, it then became Scuderia Ferrari. When Ferrari left Alfa Romeo, he went on to build his own cars. Tazio Nuvolari often drove for Alfa, winning many races prior to World War II. In 1928 Nicola Romeo left, with Alfa going broke after defense contracts ended, and in the end of 1932 Alfa Romeo was rescued by the government, which then had effective control. Alfa became an instrument of Mussolini's Italy, a national emblem. During this period Alfa Romeo built bespoke vehicles for the wealthy, with the bodies normally built by Touring of Milan or Pinin Farina. 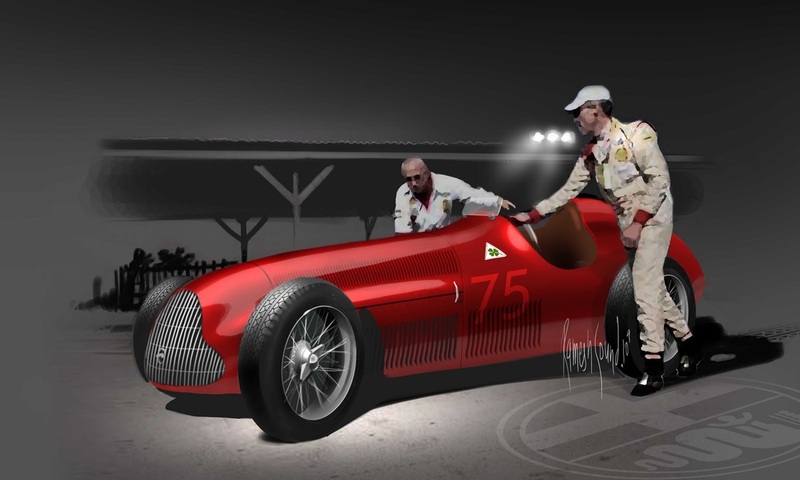 This was the era that peaked with the legendary Alfa Romeo 2900B Type 35 racers. In 1952, Alfa-Romeo had experimented with its first front-wheel drive compact car named "Project 13-61".It had the same transverse-mounted, forward-motor layout as the modern front-wheel drive automobiles. Alfa-Romeo made a second attempt toward the late 1950s based on Project 13-61. It was to be called Tipo 103. It even resembled the smaller version of its popular Alfa-Romeo Giulia. However, due to the financial difficulties in post-war Italy, the Tipo 103 never saw the production. Had Alfa-Romeo succeed in producing Tipo 103, it would precede the Mini as the first "modern" front-wheel drive compact car. 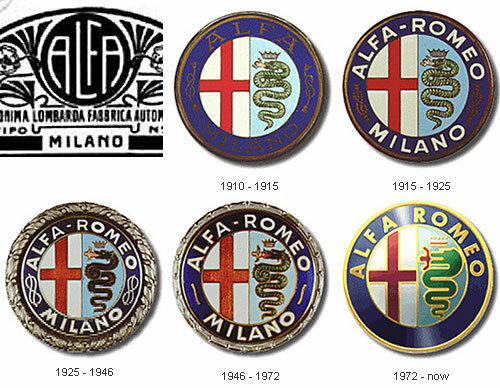 In 1918, after the company was purchased by Nicola Romeo, the badge was redesigned with the help of Giuseppe Merosi to include the emblem of the City of Milan and that of the Visconti family in a circular motif, bordered by a dark blue metallic ring containing the inscription "ALFA — ROMEO" and "MILANO" separated by two Savoy dynasty knots to honour the Kingdom of Italy. After the victory of the P2 in the inaugural Automobile World Championship in 1925, Alfa added a laurel wreath around the logo. In 1946 after the victory of the Italian Republic Savoy knots were replaced with two curvy lines. Follow The Cortile's board Cortile della Alfa Romeo on Pinterest.